Tiffin Allegro Breeze Diesel Pusher Motorhome for sale. Compact on the outside, luxurious on the inside. That’s the 2017 Tiffin Allegro Breeze, the smallest Class A diesel pusher on the road today. The Allegro Breeze is easy to drive and it handles more like a full-size SUV than a full-size RV. It's a masterpiece of spatial engineering, designed with the same attention to luxurious comfort found on our larger, more expensive coaches. The Allegro Breeze full-body paint system features premium grade paints sealed with superclear coat with ultraviolet protection. This process can require up to 12 layers. For additional protection, a scratch-resistant plastic coating protects the front of the coach, stairwell, and entry door lock. Enjoy an unobstructed view of the road ahead through the one-piece shatter resistant windshield, made from premium safety glass. Solar and privacy shades move into place with the touch of a button. 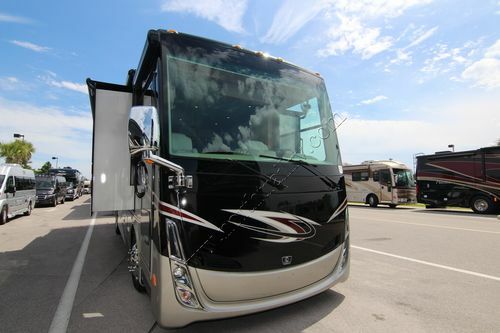 Powering the Breeze’s energetic ride is an assertive Cummins ISV5.0 V8, the result of a three-year collaboration between Tiffin Motorhomes and Cummins. The Breeze's easier maneuvering and quicker cornering is enhanced by Tiffin’s PrecisionTrack technology, which merges independent front suspension with an air ride system. Each wheel is engineered to continually adjust to changing road conditions. The 2017 Tiffin Allegro Breeze comes with the Tiffin Five-Star Warranty. The best in the business, bar none. The following floor plans are available for the 2017 Tiffin Allegro Breeze diesel pusher motorhome 31 BR and 32 BR.